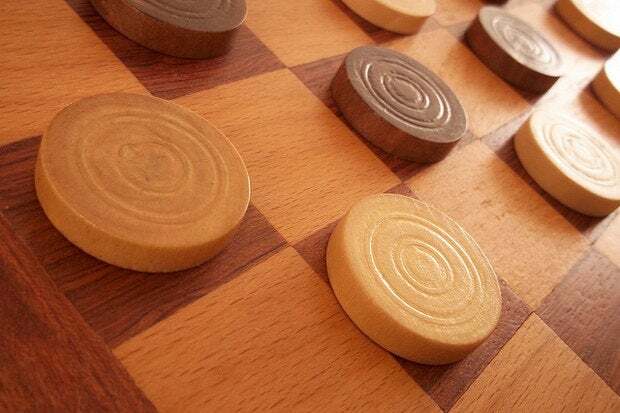 Several months ago, I was asked to create a small Java library that can be accessed by an application to render a graphical user interface (GUI) for the game of Checkers. As well as rendering a checkerboard and checkers, the GUI must allow a checker to be dragged from one square to another. Also, a checker must be centered on a square and must not be assigned to a square that's occupied by another checker. In this post, I present my library. A Board object identifies the checkerboard. It serves as a container for Checker objects that occupy various squares. It can draw itself and request that each contained Checker object draw itself. A Checker object identifies a checker. It has a color and an indication of whether it's a regular checker or a king checker. It can draw itself and makes its size available to Board, whose size is influenced by the Checker size. CheckerType is an enum that identifies a checker color and type via its four constants: BLACK_KING, BLACK_REGULAR, RED_KING, and RED_REGULAR. A Player object is a controller for moving a checker with optional jumps. Because I've chosen to implement this game in Swing, Player isn't necessary. Instead, I've turned Board into a Swing component whose constructor registers mouse and mouse-motion listeners that handle checker movement on behalf of the human player. In the future, I could implement a computer player via another thread, a synchronizer, and another Board method (such as move()). Board(): Construct a Board object. The constructor performs various initialization tasks such as listener registration. void add(Checker checker, int row, int column): Add checker to Board at the position identified by row and column. The row and column are 1-based values as opposed to being 0-based (see Figure 1). The add() throws java.lang.IllegalArgumentException when its row or column argument is less than 1 or greater than 8. Also, it throws the unchecked AlreadyOccupiedException when you try to add a Checker to an occupied square. Dimension getPreferredSize(): Return the Board component's preferred size for layout purposes. Checker(CheckerType checkerType): Construct a Checker object of the specified checkerType (BLACK_KING, BLACK_REGULAR, RED_KING, or RED_REGULAR). void draw(Graphics g, int cx, int cy): Draw a Checker using the specified graphics context g with the center of the checker located at (cx, cy). This method is intended to be called from Board only. boolean contains(int x, int y, int cx, int cy): A static helper method called from Board that determines if mouse coordinates (x, y) lie inside the checker whose center coordinates are specified by (cx, cy) and whose dimension is specified elsewhere in the Checker class. 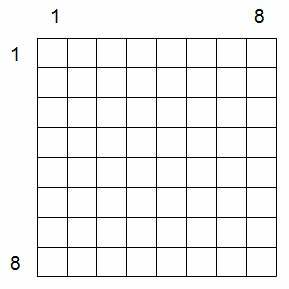 int getDimension(): A static helper method called from Board that determines the size of a checker so that the board can size its squares and overall size appropriately. This pretty much covers all of the checkers GUI library in terms of its types and their public APIs. We'll now focus on how I implemented this library. The checkers GUI library consists of four public types located in same-named source files: AlreadyOccupiedException, Board, Checker, and CheckerType. Listing 1 presents AlreadyOccupiedException's source code. AlreadyOccupiedException extends java.lang.RuntimeException, which makes AlreadyOccupiedException an unchecked exception (it doesn't have to be caught or declared in a throws clause). If I wanted to make AlreadyOccupiedException checked, I would have extended java.lang.Exception. I chose to make this type unchecked because it operates similarly to the unchecked IllegalArgumentException. AlreadyOccupiedException declares a constructor that takes a string argument describing the reason for the exception. This argument is forwarded to the RuntimeException superclass. // Obtain mouse coordinates at time of press. // Locate positioned checker under mouse press. // Snap checker to center of square. // Do not move checker onto an occupied square. // for mouse drag events. // Update location of checker center. Board extends javax.swing.JComponent, which makes Board a Swing component. As such, you can directly add a Board component to a Swing application's content pane. Board declares SQUAREDIM and BOARDDIM constants that identify the pixel dimensions of a square and the checkboard. When initializing SQUAREDIM, I invoke Checker.getDimension() instead of accessing an equivalent public Checker constant. Joshua Block answers why I do this in Item #30 (Use enums instead of int constants) of the second edition of his book, Effective Java: "Programs that use the int enum pattern are brittle. Because int enums are compile-time constants, they are compiled into the clients that use them. If the int associated with an enum constant is changed, its clients must be recompiled. If they aren’t, they will still run, but their behavior will be undefined." Because of the extensive comments, I haven't much more to say about Board. However, note the nested PosCheck class, which describes a positioned checker by storing a Checker reference and its center coordinates, which are relative to the upper-left corner of the Board component. When you add a Checker object to the Board, it's stored in a new PosCheck object along with the center position of the checker, which is calculated from the specified row and column.